In Ep. 044, we welcome Conor Richardson back to the podcast. Conor was the guest in Ep. 019, and in this episode we take a deep dive into his upcoming book ‘Millennial Money Makeover’ – due out Jan. 1, 2019. We talk about student loan debt, buying your first home, living the “rich life”, and how Millennials can take an active role in getting their finances in order. Millennial Money Makeover – Learn How to Master Your Money! Tim Mullooly: Welcome back to Living With Money. This is Tim Mullooly. On today’s episode, we welcome back Conor Richardson to the podcast. For those who didn’t listen to the first episode, Conor was our guest on episode 19, back in May. 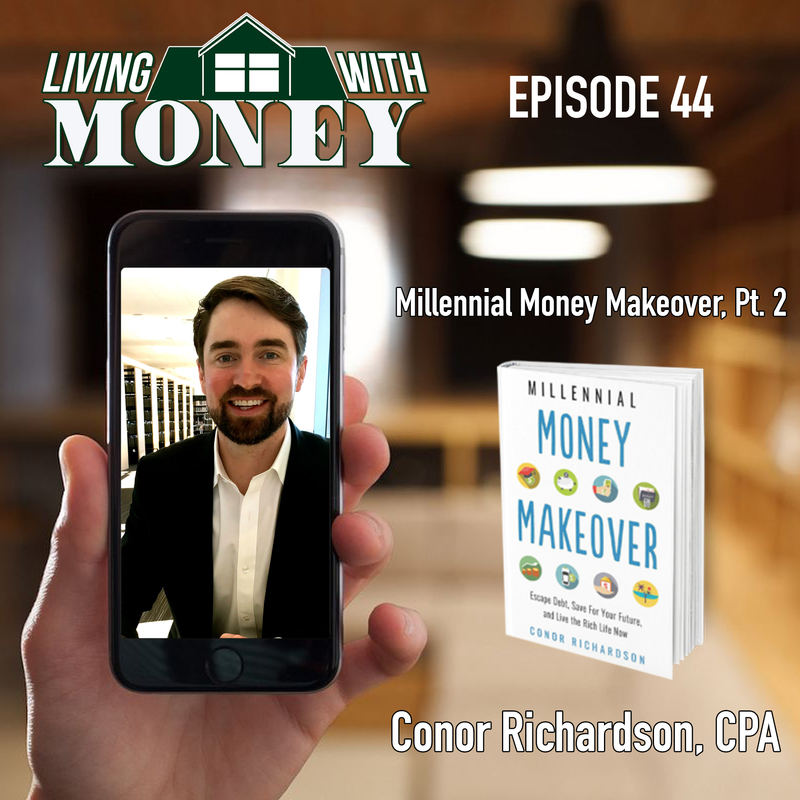 Conor’s a CPA and also the author of the upcoming book Millennial Money Makeover, due out January 1st of 2019. Conor, welcome back to the show. Conor R.: Tim, thanks so much for having me back. I’m thrilled to be here. Tim Mullooly: On the first episode we talked pretty much everything personal finance and teased the book a little bit. But for the listeners out there who may have missed part one, do you want to just give a brief overview about your background and how you got to where you are today and what you do for people now? Conor R.: Sure. Absolutely. I went to the University of Georgia, and bounced around majors there. I went from biology to psychology and eventually landed in this strange world of accounting and finance. I ended up graduating from Georgia, worked my way up the East Coast to Philadelphia, and I went to Villanova University, where I earned a master of accounting and professional consultancy. From Philadelphia, the option, really the only option was to go to New York City, which is the financial Mecca. I went up to New York City, and I started working for Deloitte & Touche, which for those of you who don’t know, it’s a very large accounting and finance firm. From there, I went on to earn my CPA as you mentioned in the intro. I was doing that when I was working full time, so that was a lot of work and a lot of effort, but it really gave me the education that I needed to be able to understand finances very well from a business standpoint, as well as a personal standpoint. From New York, I spent about four years there, and an opportunity came up in Austin, Texas, to work for a biotech startup here. I packed up my bags and moved to Austin which is where I currently live, and I work in finance right now. I also run as you mentioned, MillennialMoneyMakeover.com, which is a website dedicated to helping people master their money and turn around their financial life. Tim Mullooly: That’s also the name of the book, like I mentioned, due out January 1st of 2019. At the very highest level, the broadest level, what is this book about? Conor R.: Great question. On a high level, Millennial Money Makeover presents the case that anyone can turn around their finances and remake their financial life. It takes readers on a six step journey and transforms them from being a broke millennial to a rich millennial. Tim Mullooly: Do they need to know anything about personal finance at all, or can they just go into reading this book dry in terms of knowledge of personal finance? Conor R.: No, so this book offers you the opportunity, if you know nothing about personal finances, or quite frankly, if you know too much, to begin with a fresh slate if you will. It’s very granular, and it takes the reasons on a build throughout the book, to build knowledge and there’s tons of processes and things for them to work on throughout the book, to gain the confidence that they can master their money, and that this is not as hard as the financial industry wants you to believe it is. Tim Mullooly: Right. That’s a good point saying some people might have too much knowledge of personal finance, because sometimes you get people that might have a lot of information but maybe not the right information. Conor R.: Absolutely. So, there’s this whole concept of analysis paralysis, so you have all this information out there and what happens is people become inundated with all of this information flowing directly at them. Especially when they actually want to start to begin turning around their finances, and the reality is that you should only focus on a critical few items. There is a concept called the Pareto principle, which is known in Silicon Valley as the 80/20 rule, and the rule basically says that 20% of inputs cause 80% of outputs. That’s what Millennial Money Makeover focuses on. It focuses on that 20% that gives you disproportional results. Tim Mullooly: Right. If you could have readers take away just one thing from this book, I know there’s a ton of different concepts and things and lessons in there to be learned, but if you could have them just take away one overarching thing from the book, what would you want that to be? Conor R.: I would want it to be that Millennial Money Makeover is a tried and true playbook on how to fix your finances, and begin what I like to call the rich life. One of the things I just want to mention here, Tim, is that one of the major elements of this book is to tell millennials that they’re not alone on this journey. There are 75 million millennials in this country, 52% are unhappy with their financial situation, and this book will show them exactly what they need to do on a step-by-step fashion to get them living the life that I know they want to live. Tim Mullooly: That sounds awesome. I know in the book’s preview, and you alluded to it just now, it says over half of millennials are freaked out by their finances. Why do you think that so many millennials are freaked out or scared by their finances? Conor R.: Well, I think it has to do with their position in life right now. So, there’s a massive collision of real world life, entering in the working world as young professionals, and then you have that coupled with the financial reality of where they stand when they do enter that working world. On the one hand, they’re realizing that the world is wide open to possibilities and you have this massive opportunity for career progression. There’s a whole world to see, but then they’re hampered by the fact that on their day-to-day, their financial position doesn’t necessarily marry up to where they want to be in life at this exact moment. There’s this cognitive dissonance of acting a certain way, maybe on social media, in the day-to-day life, and then acting how you know you should be acting to remake your finances, to then get to the position of being able to do whatever you want in life. Tim Mullooly: As you were saying that, it got me thinking, do you think that on a higher level, some of those worries are the same that the baby boomers had, and the generations before them had? It’s just entering the workforce for the first time, obviously a little bit of the details are different with technology and social media, but do you think that it isn’t just specific to the millennials and it happened to everyone else too? Conor R.: I do. If you take a look at the arc of your personal finance life cycle, let’s call it, when you enter in the working world, you’re most likely in a negative net worth position, just because the majority of millennials have student loans and some type of credit card debt. As you progress through life, you start purchasing these lifestyle milestones, like a house, a car, a marriage, and you start earning more money. You begin accumulating savings and investments, and then that pain of anxiety around your financial position starts to alleviate as you progress through life. I certainly think it’s just a matter of timing for millennials, and my message is simply that. There is an absolute proven way to get out of this. You are not the first generation to deal with it. What I will say is that millennials face some unique challenges in the sense that some of the problems like the growth of credit card debt and student loans are exacerbated among millennials in particular. Tim Mullooly: Yeah, definitely agree with that. You said it before, and it says that Millennial Money Makeover takes readers on this six step journey to transform their financial life. Without giving away all six steps, could you outline maybe just the first step of the process and why you think that that is the right place to start? Conor R.: Sure. The first step in the six step program is really to make the decision to turn professional with your finances. What I mean by that is making the cognitive decision to be intentional with where you want to go in your financial life. That critical decision shifts people’s outlook, and aligns them with the task at hand. Tim Mullooly: That seems like what would be a small decision, but for a lot of people, in our generation, the millennials, you see on social media memes joking about not wanting to check your bank account after the weekend and stuff like that, but it really is a big decision to actually take your money seriously, right? Conor R.: Yes, absolutely. I mean, you can provide the smartest person in the world with the exact blueprint of what they need to do to get from A to B, but unless they make the decision that they’re actually going to turn things around, it’s useless. I make readers go through that thought process and exercise as they’re going through this book, that this is a decision that I want you to make now, which is why it’s the first chapter in the book. And then once you’ve made that decision, we can start getting serious and these are the things you need to do to accomplish your goals. Tim Mullooly: The cover of the book finishes by saying, “And live the rich life now.” Can you explain to the listeners what exactly you mean by the rich life? Conor R.: Millennial Money Makeover takes readers from having debt all the way through investing and saving, and how to build up their net worth. The rich life is getting to a certain point, and this is different from person to person, where they aren’t thinking about money anymore. I love talking about money because I’m a CPA and I love writing about personal finances and helping people, but the reality is once you are in the rich life, you aren’t thinking about money on a day-to-day basis. It’s getting away from being in debt, alleviating the paycheck to paycheck lifestyle, so that you can focus on what you want to do in life, pursue your passions, and live life to the fullest. Tim Mullooly: It’s not necessarily a rich meaning dollar amount in your bank account. It’s more of a mentality, right? Conor R.: Yes, and there is certainly a correlation between the two. I mean, a certain dollar amount gives you the mental bandwidth to not think about money anymore. Once you get rid of that immediate need of having to thinking about it, you’ve built up an emergency fund, you have a slush fund ready to go, and you’re investing, at that point it’s all about focusing on what you want to do. Tim Mullooly: Yeah, absolutely. Do you think that you can live the rich life without necessarily having thousands and thousands of dollars in your bank account, though? Conor R.: I do, but that totally depends on your goals in life. If you don’t need those thousands of dollars to support what you want to do, let’s say travel the world, if you want to be a hermit and a writer for the rest of your life, well the good news is it doesn’t really take that much income to facilitate that type of life. You need an apartment or a small house, a computer, and you’re set. Tim Mullooly: Absolutely. It’s different for everyone, but just determining what the rich life means to you is paramount. Millennials sometimes get a bad rap and get tied to certain things in the media. One of those in particular is student loan debt. Can you talk a little bit about how the book addresses the topic of student loan debt and how millennials can use what’s in the book to try and eliminate the debt? Conor R.: Sure. I want to address your first comment, though. The reason millennials get such a bad rap in the media is because it’s our parents and basically our older brothers and sisters still running the show. When millennials are in the seat, I think that this whole trend will start to alleviate. But back to your question about student loans, so 42% of millennials have student loans and 54% are highly concerned about their ability to pay that balance off. The student loan balance, any balance in this country, is ever growing. It’s standing around $1.48 trillion or something like that right now, which is just massive. In the book, I tell people if you have student loans, you need to be smart about how you’re paying that back. I’ll take you through just a step-by-step process of what I mean by that. The first one is to pay off your smallest balances first, so in Millennial Money Makeover we take advantage of research and there have been studies at Northwestern University that if you list all of your debt balances in ascending order, so the smallest one first, and you start by tackling the smallest one first and work your way to the biggest, you have a greater chance of knocking out all of the student loan debt in your life. We take advantage of that and we use the snowball method. The second step is to make sure that you’re always paying more than the minimum. You might need to pay the minimum to not let the whole rush flood over you, but when you’re serious about paying off your student loans, you want to be throwing as much cash as you can at it. Then, the third step is to help with paying more than the minimum, you need to find ways to make extra money. That can be maybe you get a bonus at work and you put that extra cash towards paying off that balance, or you’re focusing on a side hustle, whether that’s a blog, a new business, driving for Lyft or Uber, or one of the things that people don’t necessarily think about is extracting value from the assets that you already have. That can be intellectual capital, if you have student loan debts, most likely you can help somebody else in tutoring or something like that. Or, if you live in an apartment or a house, extracting value from that by maybe listing a room or the house on Airbnb to help pay off those loans and alleviate some of that. The fourth thing is to make sure that you are rewarding yourself throughout this process. Paying off student loans can sometimes take a long time, and it’s incredibly important to give yourself a gift. Once you pay off a student loan, pop a bottle of champagne, go out to eat, do all that with cash, but still do it. The fifth thing is to determine your timeline. One of the largest mistakes people make is equating long term debt with long term payments. That couldn’t be farther from the truth, because the longer you don’t pay off your student loans, the longer the student loan has to balloon out of control. What that means is the total cost of attendance, let’s say you have a $50,000 loan, that thing can turn into you actually paying back $80,000 for the $50,000 worth of education. Create your timeline, and decide whether you want to be aggressive or maybe you need to be a little bit more flexible at this point in your life and stick to that plan. Tim Mullooly: Yeah, I definitely think all of those are really great points to help these people out. I think probably for me, the biggest thing that you said there is the two points that are mental for the person. Lining up the smallest balances first, and then checking them off. Even though it’s not necessarily knocking out the biggest dollar amount, it feels good to cross that off your list and make you feel like you’re making significant progress and that keeps you mentally plugged in and not discouraged along the way, right? Conor R.: Yes. Sometimes in personal finances, what makes sense mathematically and what actually works in terms of behavioral change do not align up. This is a great example of that. Mathematically, the best thing to do is to pay off the student balance with the highest interest rate, and then you work your way down on the balances that have the highest interest rate. But the data proves otherwise, that if you focus on the small balance first, you create those mental wins and people start to feel good and feel like they can actually accomplish this large task at hand. That leads them to cross the finish line sooner than those who don’t follow that method. Tim Mullooly: Right, yeah. Sometimes it definitely pays to use the mental wins over the hard numbers. I totally, totally agree with that. Another topic that we often hear about for millennials is that millennials aren’t buying homes. Can you talk about how the book addresses buying a home and the process behind determining if you’re even ready to buy a home? Conor R.: Yes. Buying a home is a dream for most millennials still, and it definitely should be. But the problem is that that dream to own a home can quickly morph into a financial nightmare if not done properly. The process behind determining if you’re ready is you need to make sure that you have all your ducks in a row, and that means that you should completely be debt free. No credit card debt, no student loans, and the reason for that is because you don’t want to overexposure yourself in terms of leverage and you can get yourself in a very sticky situation when you have, you’re compounding your mortgage debt with your student loans, your credit cards, and if one thing goes wrong in your life, the whole thing can come tumbling down. You don’t want to enter the transaction with any other debt. You want to make sure you have your emergency fund of $3000, which is like what I recommend in the book, ready to go. You want to have at least three to six months of living expenses, and the reason this is so crucial is because it typically takes people 90 days to find employment. So, if you leave your job or you’re let go, it typically takes 90 days to get that back, so if you have three to six months of living expenses, you don’t have to worry about everything falling apart very quickly. The next thing is to, I recommend saving 1 to 2x your household income before you enter in buying your first house. The reason I say this, and it catches people off guard because, “Oh, my gosh, that’s a tremendous amount of money,” the reality is that most people when they’re buying a house, let’s say three to four to five to $800,000, never transact in those nominal amounts. What we have a tendency to do is to round up. If you have a base savings that you can refer back to, let’s say you earn $50,000, and you save $50,000, you know how long it took you to get to that $50,000. Now, you mitigate the over purchasing and buying a larger house than you really can afford. You need to make sure that you’re putting 20% down, because while the bank will let you put 3% down and get the mortgage, they’re in the business of making that interest off of you in the long haul. But the 20% is 20% for a reason. The largest hurdle, the largest barrier to entry in the housing market is the down payment. Take the time to save up for the 20%. It alleviates a lot of other costs that you don’t even think about, like the mortgage insurance, and you’ll be in a great position once you do all those things and take those steps. Tim Mullooly: Going back to the point of having all that money in the bank before buying a home, I think that’s a good idea, because like you’re saying, the down payment is usually the biggest part of buying a home, but I think people sometimes underestimate the amount of expenses included with furnishing a home, getting it to look the way you want it, having things to put inside the home. So, having that savings as well is definitely huge for someone buying a home, right? Conor R.: Yes, it’s critical, because once you step into the home, at that point it’s basically maintenance. If you want a wall to look a certain color, you want a particular set of furniture, maybe you need to add a back deck, the housing costs start to spiral out of control. That initial mortgage cost that you’re looking at, that’s just the bare minimum for entry. Then, there are all these other costs, like broker fees and things like that that you need to pay, or during the transaction, that you can alleviate if you have the appropriate savings and you’re prepared to enter the financial transaction with open eyes. Tim Mullooly: Yeah. I mean, it would be great if everyone could buy a home that’s move in ready, they don’t need to do a single thing, just bring your bags in, put it down and start living, but in reality that’s usually not the case. Conor R.: Which is why renting is so terrific for millennials, because it gives them that fixed monthly cost. There is no paying more if something breaks, you call your landlord, it gives them flexibility and all sorts of things. Tim Mullooly: Right. In the book preview, it talks about how automatic robo-advisors can help save millennials a lot of money and make them more money than going through a regular broker. Could you talk a little bit about that and how these automatic robo-advisors can really help millennials out? Conor R.: The robo-advisor market is a growing trend among millennials. So, by 2025, the assets under management for robo-advisors is projected to be about 5 to $7 trillion. What is so great about robo-advisors is they reduce the historically high barrier to entry for young investors. Some of that’s perceived, some of that’s real, but what I love about it is it makes young investors feel like they can participate earlier, and I think that that’s tremendous for their long term net worth, which is why I love talking about these guys. They offer a funnel into investing that previously wasn’t there, and it allows millennials’ portfolio to grow and enjoy the benefits of compound interest over time. There are really a handful of benefits. The first is that they’re incredibly easy to use. Millennials are digital natives, so we have technology, you can check that box, these guys solve that and they’re very user friendly. The second is they offer lower management fees than historically has been offered. 1 to 2% is about what percentage of assets under management is being charged by a financial advisor historically. Those have been whittled down to .5% and the third thing is the lower entry balances, you can start an account and start investing with above $0 really. Historically, some people wouldn’t even take your money if you didn’t have 100 or $200,000 to actually manage. So, the maintenance of investing on a regular basis is much lower, and robo-advisors help with automating your financial ecosystem, which I am adamant about doing, and especially in Millennial Money Makeover, that’s what we focus on at the end of the book, and it is crucial to leading that rich life. Because again, once you automate things, you can set it and forget it. But one of the big things about robo-advisors is that they help begin the conversation. So, what you’re starting to see in the market is this hybrid approach between robo-advisors and your traditional financial advisor, financial planner, where you’re combining the human element with the robo-investing. That’s where I see the growth really taking off, because at the end of the day, most people want to call and make sure there’s a human on the other end of the line, simply if they have a question. That’s a tremendous advantage in the hybrid approach as well. Tim Mullooly: Yeah, I’ve seen that growing as well. With robo-advisors, sometimes you can call and get an actual CFP on the line to help you if you want to talk about different financial planning topics as well, which is really good for the users. I think like you said, the biggest thing for the robo-advisors is that barrier to entry, because I feel like young people always hear the biggest advantage they have is time on their side, to let their investments grow and compound over time. But then, big national firms have these high barriers of entry, so the robo-advisors clearly win and help the millennials more because it lets them actually take advantage of that time, right? Conor R.: Yes. What is so crazy about that is that the robo-advisors are capturing the trust of millennials early. The fallacy that some of these larger financial advisors face is that they say essentially, “Great, I’m glad you’re starting to invest. Come see me when you actually have everything figured out” in essence. The robo-advisors are saying, “Hey, we’ll take you now and we will figure this out together” and you have all of these tools at your disposal to make sure that you’re trending in the right direction. I think over time what you’re going to see is that millennials will be loyal to those robo-advisors and that type of financial advice over time, because you were there with me in the beginning, why would I change now? Tim Mullooly: Right, exactly. I think it would definitely be an advisor’s benefit to learn how to incorporate some sort of robo-advisor in there to attract millennials and gain their trust. Do you think that obviously the book is geared towards millennials, it’s in the title, but do you think that some of these tips and things that we’ve been talking about can be applied to any generation? Conor R.: Yes, I do, Tim. The processes, symptoms, and action items in Millennial Money Makeover cater to people in their 20s and 30s. But the reality is that anyone can implement what is in this book and make over their finances, and the benefit of reading this book and having this book is that it’s a tremendous conversation starter between family members, so that’s mom and dad and son and daughter, or it could be a conversation starter between financial planners and clients, or financial advisors and clients, and spouses or soon to be spouses. It’s a tremendous place to start and begin the conversation to turn things around and talk about where you want to be. Tim Mullooly: Right. What better time to sit down and talk about that than at the beginning of a new year, right when the book comes out, right? Conor R.: Yes, a great point. Tim Mullooly: For you, when did you first decide to sit down and write this book and what was the biggest reason why you felt the need to write this? Conor R.: I sat down, actually about this time last year, in November of 2017, and I put together a book proposal and I got a deal signed with Career Press, and it took me about four months from January to April this year, 2018, to write the book. But the reality is, I had done the bulk of the research in the previous years. When I sat down to write the book, I was ready to go and I had everything at my fingertips. But to your point on why I wrote this book, to be honest, it’s because I felt like I didn’t have a choice. I was reading and processing a massive amount of information on personal finance and psychology and behavior, and something just wasn’t quite sitting right. I was reading all these books, but they were focusing on things to me that didn’t matter, to get people to where they really needed to be. This book gives people the exact amount of information that they need to be successful and have fun along the way. Tim Mullooly: I was going to ask you, what was the start to finish time for the book? For you, it sounds like it was relatively short. I’ve talked to a couple authors who said they’ve been working on this one book for a number of years, but for you, it’s just a couple months, because you had all the research and everything lined up and ready to go. Conor R.: Yes. I started writing in January and ended in April. Then, from that point on, there’s some tweaks and editing. I work with a whole team at Career Press, and they’re tremendous at helping debut authors get their book ready. I actually think that this equates back to personal finances and what you want to do. My goal was to not spend a year writing this book. It was to get it done in a very quick timeframe, and I used this law, it’s called Parkinson’s law, where if you develop an end point and I knew it needed to be April, and I signed off on the fact that I would do it by April, by God, I was going to make sure it was done by April. If you don’t give yourself this endpoint, then you can take several years to write it, but the reality is if you do your research, the writing is the easiest part. Tim Mullooly: Right. I like that. If you set a deadline then you have to meet it, and doesn’t let it drag on for years like you’re saying. Tim Mullooly: I know I asked you this last time, but that was back in May, maybe over the couple of months of sitting on it the answer has changed a little bit. What was the most rewarding part about writing this book for you? Conor R.: I definitely think it’s changed a little bit over time. Last time you asked me this question, I think my answer was something to the effect of interviewing people and hearing about their personal stories for the book. That was absolutely fascinating. But I think what it’s changed into is that now the most rewarding part is getting to talk about personal finances with so many people, and I’ve been inundated with emails and people coming up to talk to me about their personal financial situation, or maybe something that I would suggest them to do. That has been incredibly rewarding because basically what it’s saying is that the book is striking a chord with people, and that as an author, is incredibly motivating. Tim Mullooly: Right, yeah. I mean, that’s essentially why you write the book, to start a conversation and to help people out, right? Conor R.: Yes. And it’s funny, because people that I know that understand that I’ve written this book and it’s coming out, sometimes you’ll be at a party or maybe a lunch and people will grab your arm and pull you aside a little bit, and whisper a question to you. You’re able to address it, but I love that. I love the conversation and steering people in the right direction. It’s what makes this worthwhile. Tim Mullooly: Awesome. The book’s done, it comes out in about a month and a half now, besides the press and everything leading up to the book, is there anything next on the horizon for you? Maybe more books in the future or something completely different? Conor R.: More books? Potentially, but I think I’m done for writing for a little bit, and my main focus right now is to spread the good news of Millennial Money Makeover and reach as many millennials as I can with this message to help them turn their ship around. Tim Mullooly: Awesome, yeah. I mean, there are plenty of millennials who need to hear everything that we’ve talked about and everything that’s in the book, so you’ll have no shortage of millennials to reach with that. One final question for you, what’s one piece of advice that you would give to a young individual just getting started, either in the finance industry, or perhaps getting ready to write their first book? Conor R.: I’ll take both. I’ll address the finance industry first. What you need to do, I’m assuming you’re talking about … Are you talking about personal finances or just starting off in the working world? Conor R.: Yep. I think the first thing to do is to address the elephant in the room, and get rid of all the debt that you have. Student loans, credit cards, consumer loans, if you have a car loan or something like that, and then start the process of accumulating. The earlier you do this, the less you have to think about your financial future and you can start doing things that you really care about, and it will alleviate a whole host of problems. I think for the person who is interested in book writing, I would honestly say most people should not write a book. If done well, it is an incredibly grueling process, but if you have something inside you that you feel like you just need to get out into the world, and you sit on it for a little while and it’s still there, and you feel like you have no other choice, then go after it. Tim Mullooly: Right. Well, Conor, that was all the questions I had for you today. Thanks for coming back on the podcast. I appreciate it. Conor R.: Thanks so much for having me, Tim. Tim Mullooly: For the listeners out there, like we talked about, Millennial Money Makeover, Conor’s book, is due out January 1st of 2019. We’ll put a link in the show notes to where you can pre-order the book and read more about it if you want more information. We’ll also link back to episode 19 of the podcast if you missed part one with Conor. Thanks for listening to this episode of Living With Money and we’ll see you on the next one.